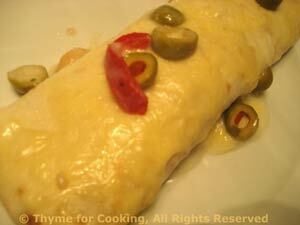 Tuna and White Bean Enchiladas, Thyme for Cooking recipes. You could use shredded turkey or chicken in these as well as the tuna. I use Gruyère cheese but Colby or Cheddar would be equally good. The green olives work well with both the tuna and the sauce, rounding out the flavors.